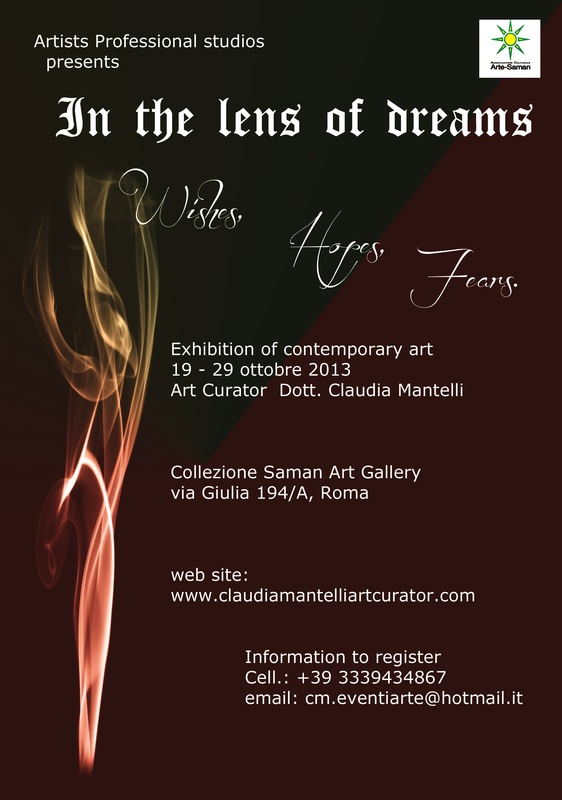 The exhibition will be held from 19 to 29 October 2013 in the halls of the gallery ” Collection Saman ” in Via Giulia . Opening October 19 at 18.30 . For paintings, photographs, drawings and prints, sculptures (various materials) must not exceed 80 cm in height , Design, Performance 1 ( Each artist must agree with Claudia Mantelli, send the photos of Works of Art , after paying the cost for the Location, no later than September 25 ) The cost includes setting up and dismantling , inauguration , advertising with mailing lists, layout and printing of advertising material, recording on the major thematic portals with the names of the participating artists, surveillance, and voice, organization, advertising and printed media, contacts with newspapers, pictures and Videos on Youtube and continues advertising on the Sitehttps://claudiamantelliartcurator.com/. Since they started to join some artists , advice to sign up faster because the works of each artist will be published immediately after the Inscription on this web -site and all over the Web , in order to introduce the knowledge of the participating artists , their works Art but not those Exposed . We also need to complete the Registration quickly because I have to advertise, make a hardcopy brochure , the media , talk to JournalistsCollectors and everything has to be done professionally for avbere an excellent result. The Works of art that will be exhibited will be published at the time of the exhibition .Participation is free but controlled by the President Claudia Dott.Mantelli , Curator and Organizer of Art and the Team.Please confirm your participation with the payment of the fee after you send the photos of Works of Art for selection no later than the20/25-09-2013 . I advise you to streamline operations in order to participate because the artists are many and very good. To join this initiative please contact Claudia Mantelli+39 333 94 34 867 – MAIL cm.eventiarte @ hotmail.it ..For the selection , are to be sent together with this completed form , the photos of the works to be proposed ( in jpg format not exceeding 800×800 pixels ) .Please fill out the form and it is necessary to send the Mail written . and I undertake to formalize the membership within the required time .Furthermore , I declare that the work presented is exclusively the result of my creative ability and , according to the law 196/2003 on privacy , expressly authorize the treatment of my personal data. All material presented above (photos, cd , catalogs … ) , will not be returned . MAIL BOXES M.B.E. 089Via dei Mille 38/4000185 ROMATEL :FIXED +39 06 4461945Cell / Mobile +39 348 8269 566Contact Mr. LUIGIFor the transport of the works , and also from abroad , please contact Mr. Louis BY MAIL or TELEPHONE .MAIL mbe089@mbe.itor phone . Ile Works can also be sent to Saman Gallery , October 16, 2013 for the exhibition of 19 October 2013 , during the opening hours of the gallery and must be accompanied by a sheet that describes . (including the price ). Prev Roberto Nile -Untitled- Acrylic on velvety paper 100×70 cm.